Contents: 1st pt. The 1st, 2nd and 3rd stavakas with the commentary of Ruchidatta and the gloss of varddhamana. -- 2d. pt. The 4th and 5th stavakas with the commentary of VarddhamaÌna and the gloss of Ruchidatta. Commentary of Rucidatta entitled: KusumaÌ„nÌƒjaliprakaÌ„sÌamakaranda; that of VardhamaÌ„na: KusamaÌ„nÌƒjaliprakaÌ„sÌa. 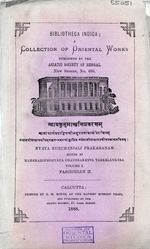 Edited by Mahamahopadhyaya Chandrakanta Tarkalankara.